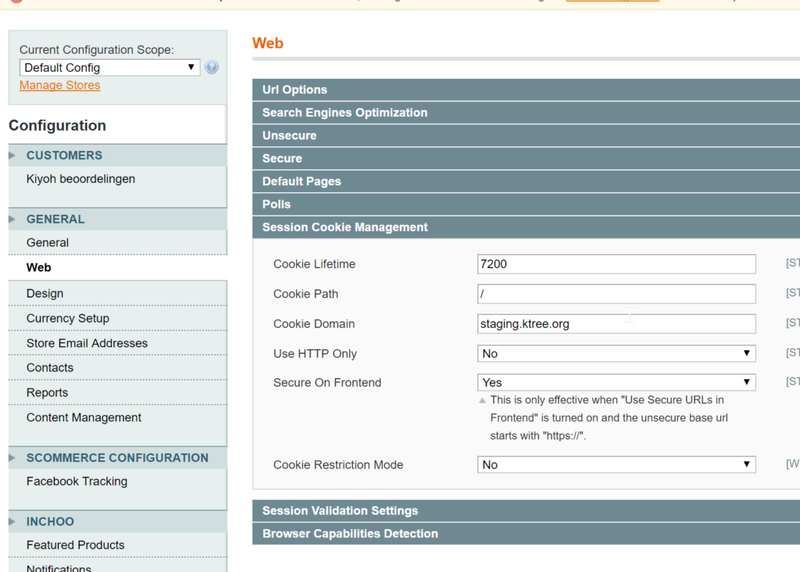 Cookies are configured in Magento via the Configuration admin menu – System > Configuration > General > Web. If you haven’t experienced this problem, then you haven’t worked with Magento long enough! This is how it typically happens: when you login by entering your username and password, you will be redirected to the same login page and URL, and your browser is appended with nonce id. This happens for both the customer front-end and the Magento back-end login. Let’s look at a few reasons why this happens, and how we should resolve those issues. Let’s say your Magento site is example.com and the cookie domain in Magento is configured as xyz.com. In this scenario both Magento cookies will set Domain Value as xyz.com, but for validating the session Magento will consider the domain through which the site was accessed — in this case example.com. Since it won’t be able to find an active session with the example.com domain value, it will redirect the user to the login page even when valid credentials are provided. You may normally see this when you migrate your Magento instance from one domain to another domain, for example from Production to Staging, and forget to change the cookie domain. Note: you can run the provided cookieTest.php script, which validates what the server cookie domain is, and what is set in the Magento config. Change the Cookie Domain via the Configuration admin menu. Go to System > Configuration > General > Web, as per the screenshot. Alternatively you can change this by running these SQL queries. After executing this query, we will get the results. Verify the ‘value’ column is the same as your domain. Update the value if it is not the same as your domain. Let’s say your site is example.com. Logging into example.com/admin works fine. But on your staging/QA site, for example staging.example.com/admin, you are unable to login without deleting all cookies. The system may allow logins to staging.example.com, but when we login again to example.com/admin, your next click on staging.example.com kicks you back to the login page. Similar behavior is experienced for customers using the front-end login as well.